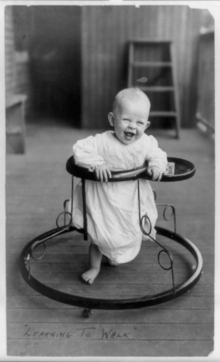 A baby in a baby walker, 1905. A six month old child sitting in a baby walker, 2012. Many parents believe that such walkers teach a child to walk faster. However, they may actually delay walking by two to three weeks for a typical child. The amount of use matters; for every 24 hours babies spend in a baby walker (for example, one hour per day for 24 days), they learn to walk three days later and to stand four days later than they would have. Baby walkers have also led to many preventable injuries such as violent parental shoving, toppling over, skidding on wet linoleum, tripping up,  These include injuries from falling down stairs while moving around in the baby walker, often with injuries that are worse than typical for falling down the stairs. Walkers allow babies to reach areas they otherwise couldn't, including pools, bathtubs, and kitchens, where they can be at risk for burns from pulling hot food off stovetops. The US Consumer Product Safety Commission, American Academy of Pediatrics, Kids In Danger, and other organizations have issued warnings to discourage parents from using baby walkers. Direct education of parents in a medical setting reduces parents' willingness to use these devices. In Canada, the sale of baby walkers was banned on April 7, 2004. Canada is the first country in the world to ban the sale, importation and advertisement of baby walkers. This ban extends to modified and second hand baby walkers, including those sold at yard sales or flea markets. The Consumers Product Safety Improvement Act of 2008 (CPSIA) changed the items that were allowed to be sold at such sales. Owners of baby walkers may be fined up to C$100,000 or sentenced to up to six months in jail. The data on the injuries caused by the walkers, compiled by the Program of Prevention and Report of Injuries of the Hospital of Canada (CHIRPP),  led to the Canadian ban, since it revealed that, between the months of April 1990 and April 2002, 1,935 injuries caused by the use of baby-walkers were treated at the 16 reporting hospitals across Canada. In the United States, annual baby-walker-related injuries dropped from around 21,000 in 1990 to around 3,200 in 2003, attributed to publicity about the danger of such devices and voluntary safety improvements by manufacturers. Eight babies died from such injuries between 2004 and 2008. Annual injuries dropped a further 23% after mandatory US Consumer Product Safety Commission standards went into effect in 2010, including testing requirements and brakes to prevent stair falls. A toy with four wheels and a handle at the top. A toddler can stand behind this toy and push it while walking. Parent-assisted baby walkers were developed as an alternative to traditional baby walkers. These types of baby walkers differ greatly from traditional baby walkers as they have no wheels and require full parent assistance while in use. The design of modern parent-assisted baby walkers is similar to leading strings in that the child is suspended upright from straps while learning to walk. Parent-assisted baby walkers offer a safer method for teaching a child to walk over traditional baby walkers that can be unattended while in use. There are also immobile play centers (baby jumpers), which look very similar to baby walkers, but which have no wheels. Baby Jumpers works on the strength of the baby’s legs as they essentially push or jump themselves up from the ground. Consequently, the baby is unable to move to dangerous locations. Some toys with wheels are designed for young children to hold on to while they are walking. Baby walkers were known as early as the 15th century in Europe. An illumination in the Hours of Catherine of Cleves, a Dutch manuscript from that time, depicts the infant Jesus in a wooden baby walker. Go-cart was a common historical name for the wheeled version. Other alternatives were also used. A baby-runner was a padded wooden ring, set at the height of the baby's waist, on a pole that was fixed into the floor and ceiling. The baby was placed inside the ring and able to move in a circle around the pole. This prevented the baby from reaching dangerous places, such as hot ovens. ^ Burrows P, Griffiths P (November 2002). "Do baby walkers delay onset of walking in young children?". Br J Community Nurs. 7 (11): 581–6. doi:10.12968/bjcn.2002.7.11.10889. PMID 12447120. ^ Garrett, M; McElroy, A M; Staines, A (2002-06-22). "Locomotor milestones and babywalkers: cross sectional study". BMJ : British Medical Journal. 324 (7352): 1494. doi:10.1136/bmj.324.7352.1494. ISSN 0959-8138. PMC 116446. PMID 12077035. ^ a b c "Parachute - Preventing Injuries. Saving Lives". www.parachutecanada.org. ^ a b c Canada, Health (2004-09-28). "ARCHIVED - Injury Data Analysis Leads to Baby Walker Ban - Canada.ca". www.canada.ca. ^ a b Gielen, Andrea C.; McDonald, Eileen M.; Shields, Wendy (2015-01-01). "Unintentional Home Injuries Across the Life Span: Problems and Solutions". Annual Review of Public Health. 36 (1): 231–253. doi:10.1146/annurev-publhealth-031914-122722. PMID 25581150. ^ Young, Ben; Wynn, Persephone M.; He, Zhimin; Kendrick, Denise (2013-11-01). "Preventing childhood falls within the home: overview of systematic reviews and a systematic review of primary studies". Accident Analysis and Prevention. 60: 158–171. doi:10.1016/j.aap.2013.08.001. ISSN 1879-2057. PMID 24080473. ^ a b "Baby Walker Information from Health Sciences Centre in Winnipeg, Canada". Archived from the original on 2008-10-21. ^ "Injury Data Analysis Leads to Baby Walker Ban". 2004-09-28. ^ "Baby walkers outlawed in Canada". 2004-04-08. Retrieved 2015-08-31. ^ "CPSIA Changes". CPSC. 2008. Archived from the original on 2010-05-27. ^ "The Juppy Baby Walker". Yahoo! News. 2010. ^ "The Best Baby Jumpers Buyers Guide! | Everything you Wanted to Know!". The Best Baby Jumper. 2017-05-08. Retrieved 2017-11-16. ^ Lamar, Cyriaque (23 October 2012). "Behold, the divine baby walker of Jesus Christ". io9. Retrieved 24 October 2012. ^ a b Snodgrass, Mary Ellen (2004-12-29). Encyclopedia of Kitchen History. Routledge. p. 201. ISBN 9781135455729. Wikimedia Commons has media related to Baby walkers. This page was last edited on 13 February 2019, at 03:39 (UTC).